The Gainsborough right hand corner sofa will be a stunning focal point in your living room, adding timeless style and undeniable comfort that you’ll enjoy for years to come. 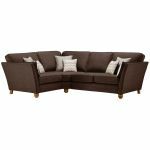 The high back and gently flared arms are designed to maximise seating area while providing an elegant finish, so you and your guests can relax with ease. 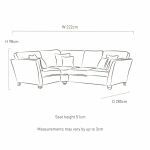 Solid hardwood is used in the frame and feet, providing strength and durability that you can rely on, and our ultra-comfy, no-plump cushions will retain their quality over time. Check out matching footstools and other pieces from the Gainsborough range to create a coordinated scheme across your home.